Here is what we do with Nutrition Response Testing®. Instead of connecting electrodes to the reflex areas being tested, the Nutrition Response Testing® practitioner contacts these areas with their own hand. With the other hand, he/she will test the muscle of your extended arm. If the reflex being contacted is “active” the nervous system will respond by reducing energy to the extended arm, and the arm will weaken and drop. This drop signifies underlying stress or dysfunction, which can be affecting your health. The analysis is done through testing the body’s own neurological reflexes and certain acupuncture points on the body’s surface. 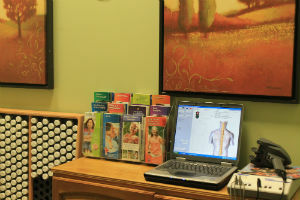 Nutrition Response Testing® analyzes the different points and areas on the surface of the body that relate to the state of health and to the flow of energy in each and every organ and function of the body. Each Nutrition Response Testing® reflex represents a specific organ, tissue, or function, and indicates the effect that energy, or the lack of energy, is having on the body. By testing the Nutrition Response Testing reflexes, we have a system of monitoring your body at each visit that has proven to be extremely accurate clinically, and that helps us identify exactly what the body needs and how well we are meeting that need. A complete Nutrition Response TestingTM analysis can be done on each subsequent visit. Often these reveal additional layers of dysfunction. These can then be addressed in the correct sequence for your body. Therefore, since very case is different, by following the correct sequence as revealed through Nutrition Response Testing, even the most complicated cases can be handled. Because we did a Nutrition Response Testing analysis for him or her, we found the “active” reflexes, and then made specific nutritional recommendations to help the body return to an improved state of health. Most importantly, the person is following through on our recommendations. We are prepared to do the exact same thing for you now. Isn’t that exciting? However, the best is yet to come. Contact us today to schedule your appointment.